Get 10% off your first appointment with the Mobile Foot Health Clinic in the comfort of your own home. Treatment in the comfort of your own home. Evenings and weekend calls available. Do you suffer from, Corns, Callus, Verrucas, Athletes Foot, Fungal Infections, Ingrowing Toe Nails. 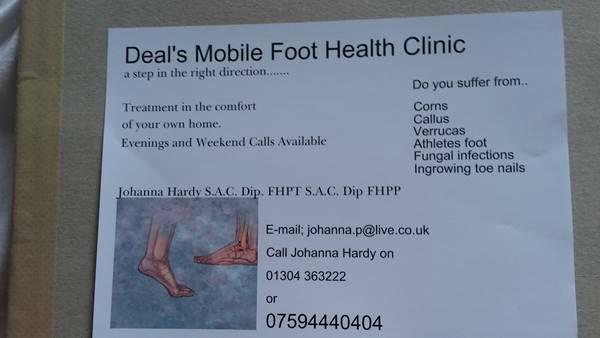 The content for this deal is supplied by Deal's Mobile Foot Health Clinic and Deal Card hold no responsibility for its content or accuracy in accordance with our terms and conditions.